Where do tribal tattoos come from? 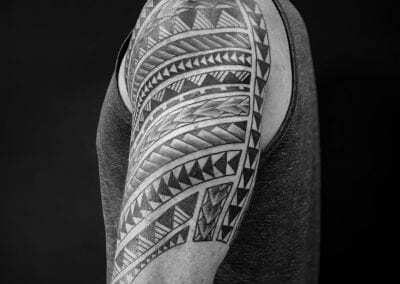 Do all tribal tattoo designs have a meaning? What do tribal tattoos look like? What are the different types of tribal tattoos? Why choose ALL DAY Tattoo studio In Bangkok for your Tribal & Maori Body Art? There is little doubt in this day and age that the majority of you will have seen someone sporting a strange, primitive-looking tattoo. 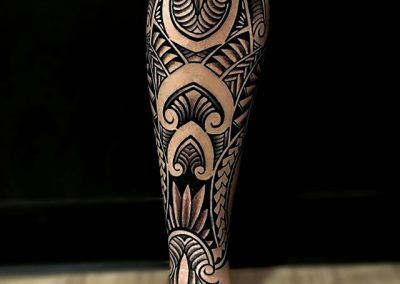 This type of body art is often referred to as Tribal or Maori tattooing. Such tattoos are popular with celebrities and ordinary people alike, but have you ever wondered about their origination and what some of the seemingly bizarre designs actually mean? 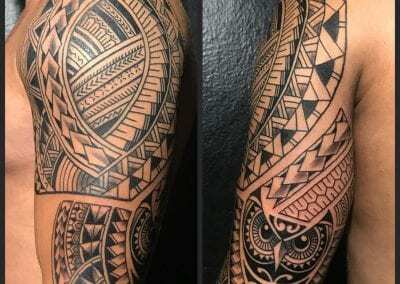 Many designs from this tattoo genre have been copied from ancient tribal designs but it is debatable whether the majority of those who wear such tattoos know the meaning behind their chosen tattoo. In truth, many wearers do not mind, they have chosen the design because they feel it looks ‘cool’. 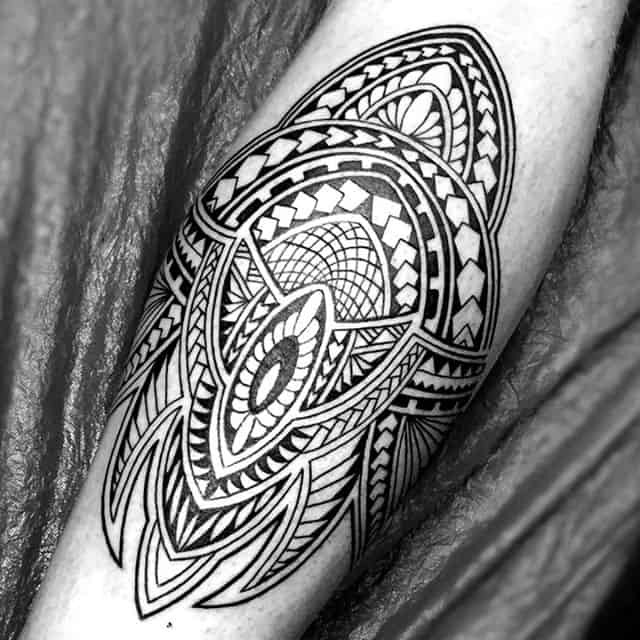 While the experienced ALL DAY Tattoo studio artists fully agree that professionally designed tribal designs can indeed look very, very cool, we also believe you should be aware of what your chosen design means. Anyone spending time in Bangkok who has the desire to receive some awesome tribal ink would be well served by visiting the easily accessible ALL DAY Tattoo studio which is located in Sukhumvit, right in the middle of Bangkok. 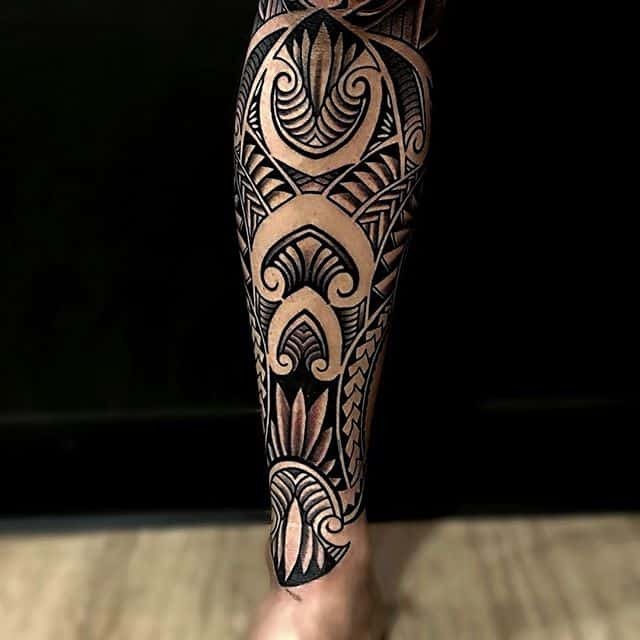 We guarantee a warm, friendly welcome and comprehensive advice on Tribal and Maori body art that is second to none. Our highly experienced, professional team of managers and artists will advise on every aspect relating to ancient tribal designs and they have the versatility to adapt any design to your preference. Tribal tattoos are at the very the heart of tattoo history. Indeed, without them there is a good possibility that there wouldn’t be tattoos at all! Ancient tribes from across the globe – Africa, Asia–Pacific, the Americas and Northern Europe – all have a rich and ancient heritage of tattooing their faces and bodies with unique markings that date back thousands of years. Many tribal markings and drawings are still worn in the present day by the descendants of these ancient tribes; and the tribal tattoo artists that ink them are often the direct descendants of those who practiced the art hundreds of years ago. Tribal markings always have a meaning, usually relating to the culture and religion practiced by the tribe. They might also give the bearer courage and strength, long life and protection from their enemies and evil demons. They can also be a symbol of rank and may mark the bearer out as a leader, a chief or even tribal royalty. Many markings, especially in Africa, were often used to identify the wearer as belonging to a specific tribe. In some areas of Africa, this custom is still practiced today although there are moves afoot in certain Nigerian states to ban the practice on children, particularly on their faces. As with any tattoo, the answer is they could look like almost anything! 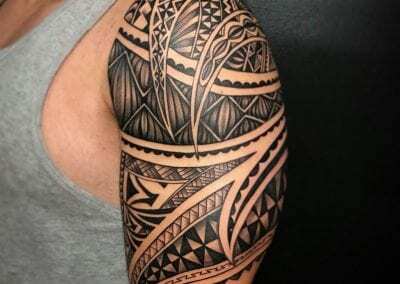 Countless tribal designs have been created throughout history but all tend to have certain things in common which mark them out as a “Tribal Tattoo”. 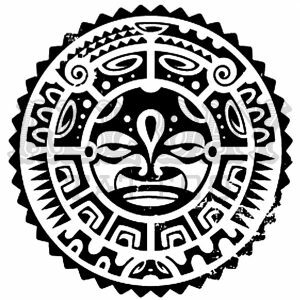 It is also common to include animal figures or masks as part of the design. These tattoos might contain just a single one of the above elements in a small tattoo, or they can be very complex designs which will include many different elements and are woven together into intricate, unique patterns. 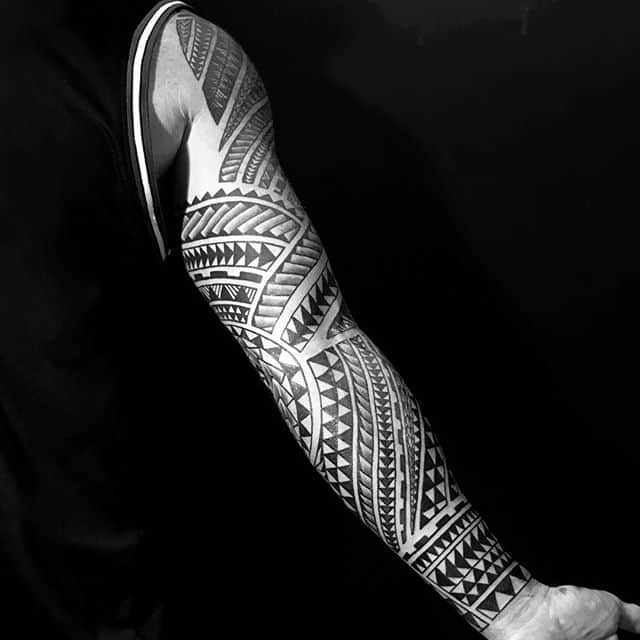 Solid bands of black ink, similar to the modern day ‘blackwork tattoos’, which have their roots in tribal designs may also be used. Throughout history there are countless tribes that have used tattoos as part of their culture. First and foremost we must look at Africa, where Homo sapien, or ‘man’ himself first originated, some 200,000 years ago. In Africa, there is evidence of tattoos dating back at least 2,000 years. Examples being the strange symbols of fertility on ancient Egyptian women; and in more recent history, slaves sent to the Americas were marked with a personal identity in case they tried to escape. Due to their dark skins, a practice known as ‘cicatrization’ was used. The skin is cut into a particular pattern and then the wound is rubbed with ash, creating a permanent scar. Very painful…but very effective. These days, with modern, much less painful techniques, many Africans still wear tribal markings. The higher ranked members of a tribe tend to have more intricate markings and women often have tattoos on their lips and chins which are considered marks of beauty. 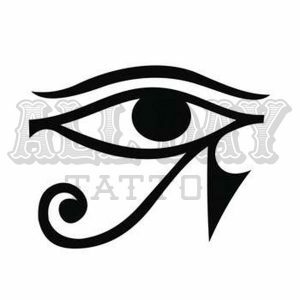 A famous tattoo from Africa’s past is the “Eye of Horus”. This was used by ancient Egyptians and has been found in mummified bodies on both men and women. These tattoos afforded protection from evil spirits and signify social status. The larger the tattoo, the higher the nobility or rank. 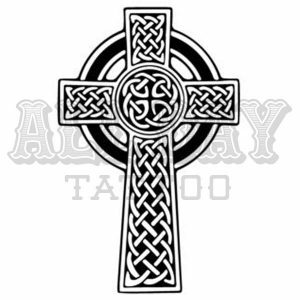 Religion influenced later North European tribes, who used the Celtic Cross and Celtic knots. 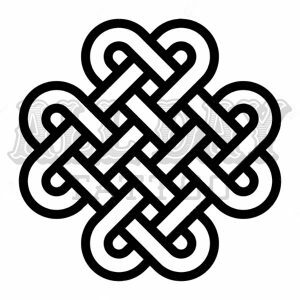 Other ancient Celtic designs include birds and trees, and later, angel’s wings. The Iban tribes originate in Sarawak, and also parts of Sabah and West Malaysia. They are famous for their ferocity and headhunting activities and expansion of their territories. 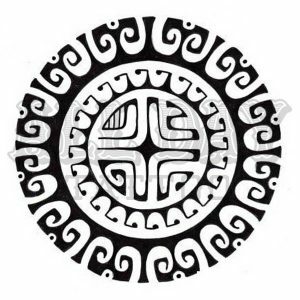 Their tattoo designs can be of plants, animals or even humans, and are believed to extract spiritual energy from the thing being drawn on their bodies. 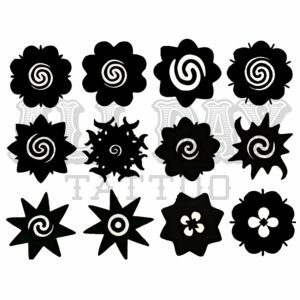 Large floral designs in pitch black ink are the best known and are placed on the back of the shoulder, or chest or legs. 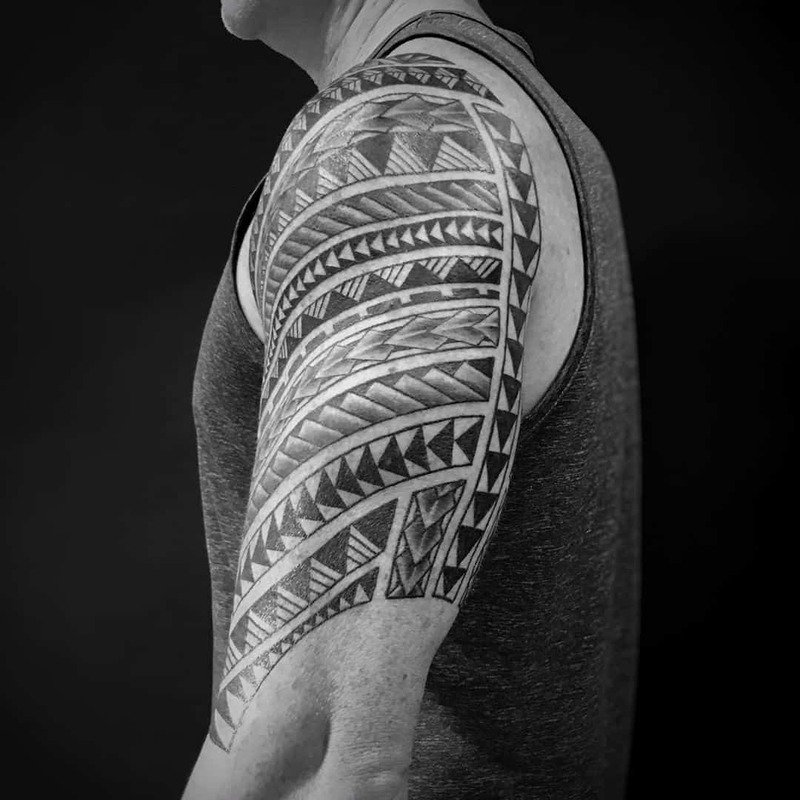 There is a great deal of misunderstanding relating to Polynesian tattoos. People often only see them as being Maori or Samoan inkings only. This is not the case. 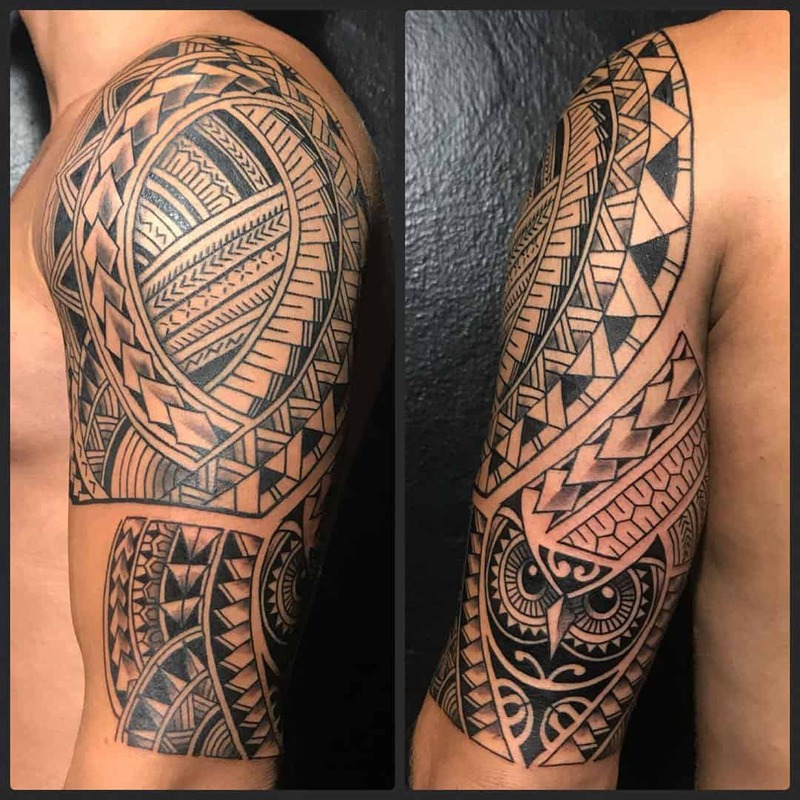 It is true that these two types of designs originate from the same Polynesian group of people, but it is also true that individual Polynesian islands have different designs and meanings. 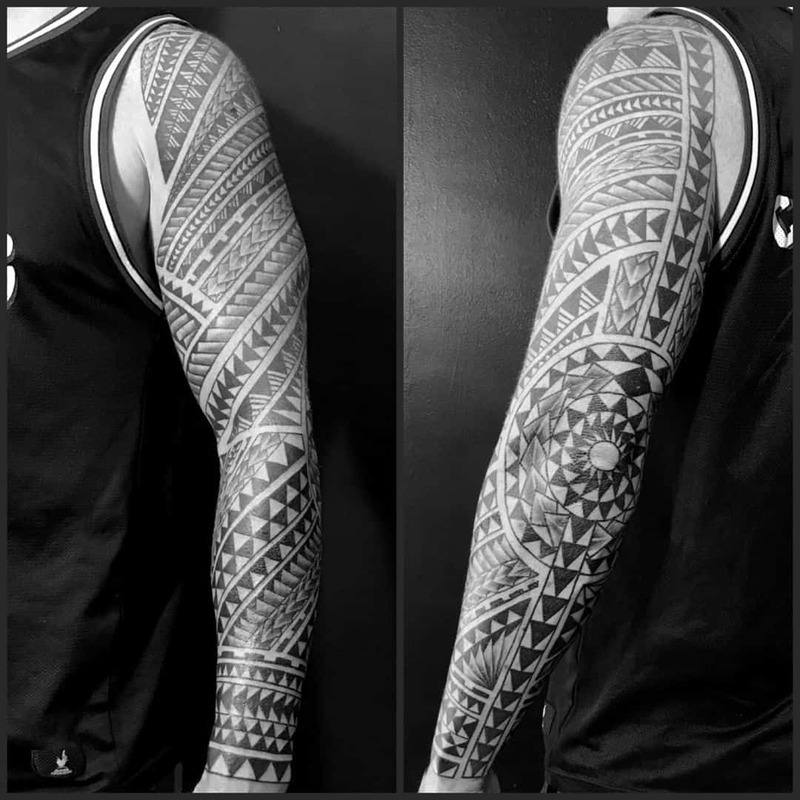 While we have described Maori and Samoan tattoos in separate sections below, these are also classed as having their generic roots in “Polynesian tattoos”, and are amongst the most popular requests the ALL DAY artists receive. It must be said that in today’s world it is unusual to see a truly “historic” tattoo from one of the islands given. 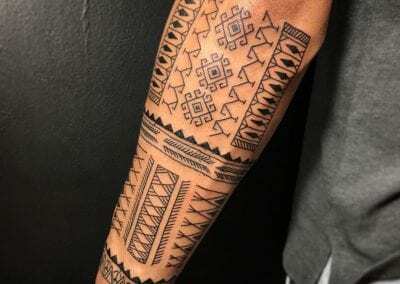 A major reason for this is that during the ‘70’s and 80’s there was a revival in the popularity of Polynesian tattoos that were a fusion of the different indigenous styles. 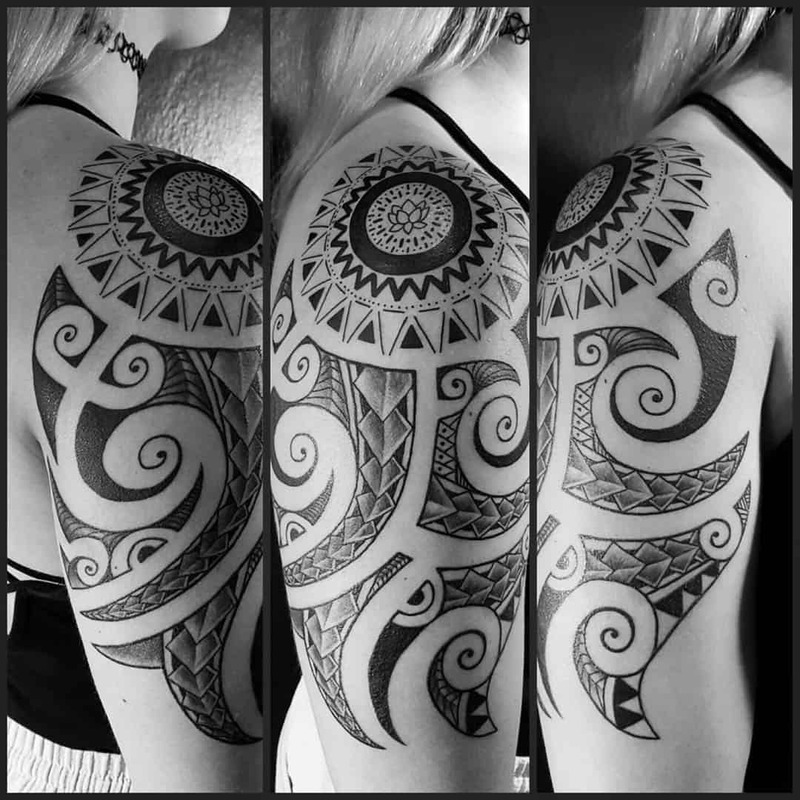 The result is there for all to see in these hybrid designs that mix, match and include motifs from the various traditional Polynesian tattoo designs. The spiral motif of the Maoris and the shark’s teeth motif of the Samoans are frequently applied. Indeed, many tattoo artists distinguish such designs as being “one culture” specific. 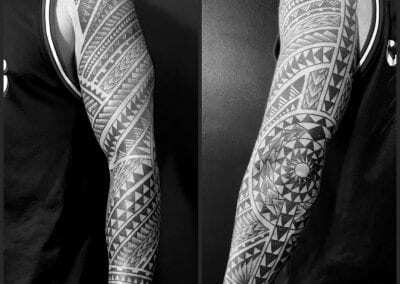 When looking at modern Polynesian style tattoos you may hear them called pan-Polynesian or neo-Polynesian tattoos. 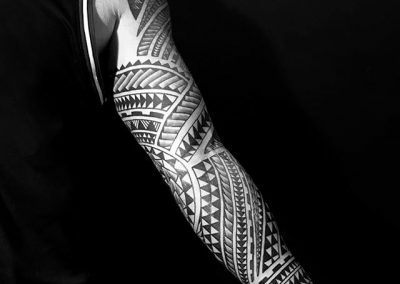 For many modern day tattoo aficionados, the style and shape of Polynesian designs is what draws them to receive such inkings. 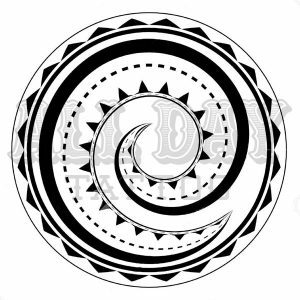 Having said this, there are many differing styles when it comes to Polynesian tattoo designs because each island has its own set of unique symbols and meanings. This makes it recommendable to carry out research on the design(s) you are after. By doing so it will help you to understand exactly what you want inking on your body and gain insight into the meaning behind your preferred design. The Maoris, who live in modern day New Zealand, consider their head as the most sacred part of their bodies, and the Maori face tattoos are well known the world over. Tattoo designs placed on the head are extremely intricate, and it is claimed that no two tattoos are the same. Maori tattoos are noted for their high degree of craftsmanship and while the traditional artists use knives and chisels to create shapes and figures on the wearer’s skin, this is an extremely painful process that is only given to the elite few and symbolizes rank and prestige. Fear not, those looking to receive a Maori tattoo design from the ALL DAY tattoo team of highly experienced artists will not find a knife or chisel ever being used on them! 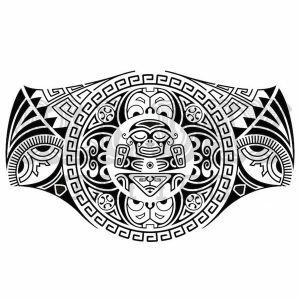 Samoan tattoos are very popular in the modern world, and they have a wide variety of designs, such as the “Marquesan Cross”, ocean swirls and sun rays. There are different designs for men and women and the tattoos are usually inked on the lower parts of the body. 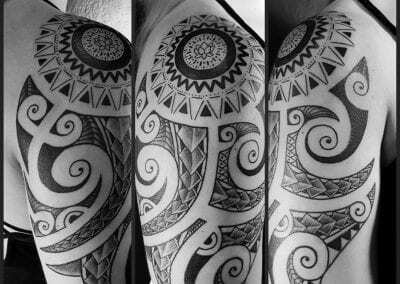 One of the main purposes of Samoan tattoos is to give protection from wild animals, both from the land and in the sea. The ancient Mayan tribes are famous for their depictions of wild animals, demons, and ghosts that have been found on pyramid walls as well as tattooed on human skin. 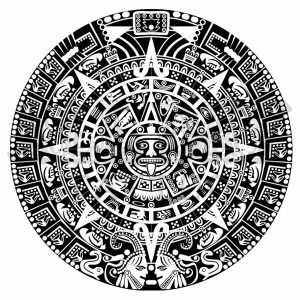 Another famous tribal design is the “Mayan calendar”. Tribal warriors from the Aztec tribes wear drawings of deities which are supposed to offer protection as well as showing their social status and their warrior victories. 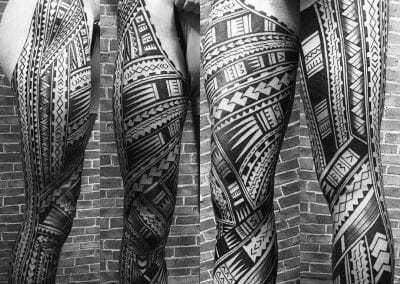 Back in the 1980s and early 1990s, tribal tattoo designs became a huge fad within certain sections of the younger – ‘x-generation’ – particularly in the USA. The ancient tribal designs were copied to represent fashion and were proudly worn as style accessories although it must be said that many recipients had little or no idea of their original meanings. Tribal communities across Africa and the islands of Polynesia, The Philippines, Brunei, Hawaii, and Samoa were none too pleased with having their sacred designs ripped off in such a manner. These days, we in the tattoo industry have learned to co-exist with the tribes that still use ancient and often sacred markings, and when we use them, we do so with respect. At ALL DAY Tattoo studio our artists have a wide-ranging knowledge and experience in various tribal tattoo designs and styles. 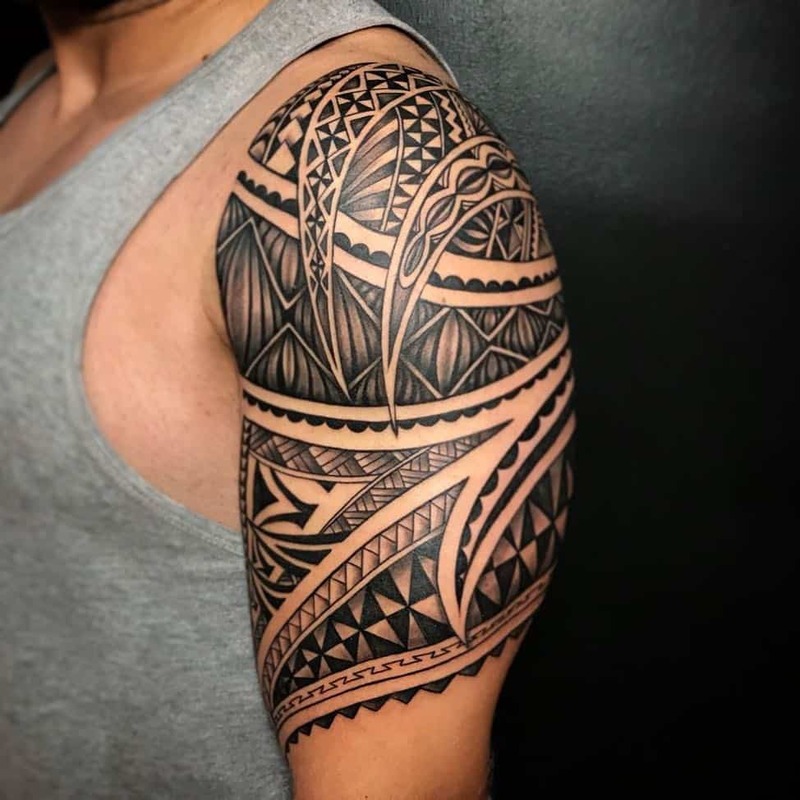 With our extensive base of knowledge relating to Tribal and Maori Tattoos we are confident that you will find us the best studio in Bangkok for this style of ink. Our “custom” studio approach means you do not simply choose something from a book and have it put onto your skin. You tell us what you like, find some designs you love, give our team the opportunity to advise and the end result will be a beautiful piece of body art you will be proud of. 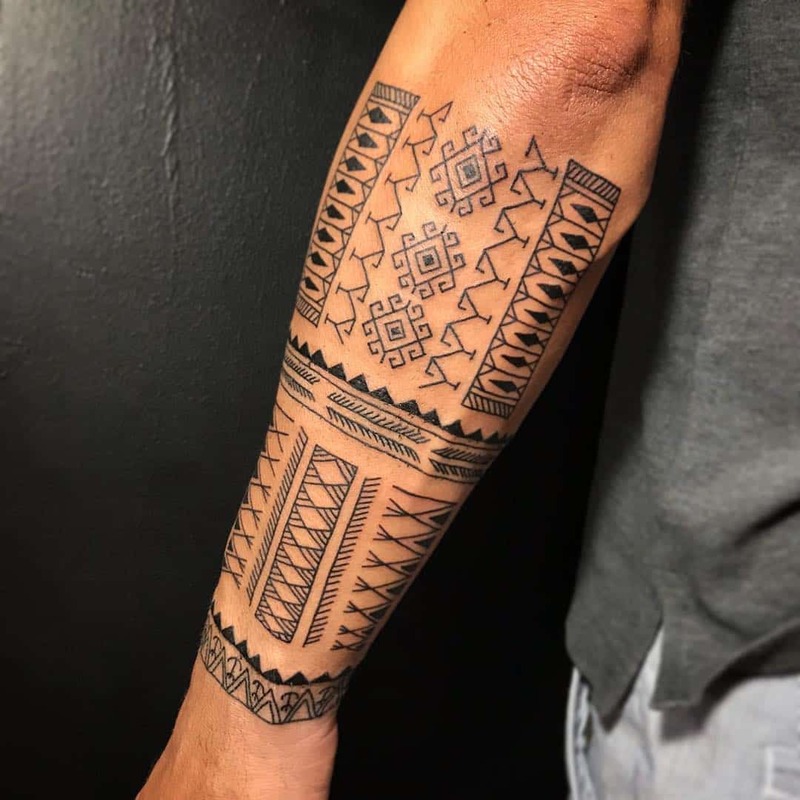 We are ready to work with you in order to come up with a unique design that contains elements of traditional tribal markings but still respects the tribal source and get you a great looking tribal tattoo in Bangkok. 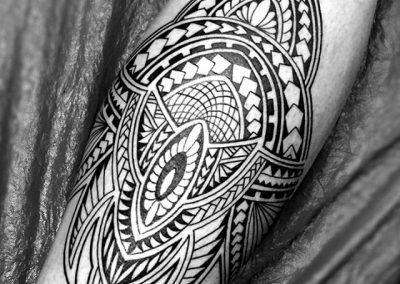 If you have seen a tribal design that appeals to you, or you would like some inspiration, come and chat with us at our ALL DAY Tattoo studio in Sukhumvit. Our professional, friendly and knowledgeable team will give you their honest opinion on what will work best for you. We will also advise on the all important choice of exactly where on your body it should be placed. We can get very booked up, so while you’re always welcome to just walk in to the studio, to make the most of your time we suggest you contact us first if possible. For a no obligation, personal consultation please feel free to message the ALL DAY Tattoo Studio in Sukhumvit, Bangkok to arrange a visit and meet our patient, friendly, helpful and highly knowledgeable team while discussing your desired Tribal or Maori tattoo design. Alternatively, contact us via one of the methods below and our fluent English speaking team will get back to you as quickly as we can.